Although most gobies are marine species, there are some that can thrive in freshwater ponds. In this regard, they provide a number of advantages, including hardiness, a small size, can interact peacefully with other fish and are undemanding when it comes to maintenance. They are also quite affordable. The best options for backyard ponds are marbled goby, dragon goby, bumblebee goby and cobalt goby. Marbled goby are the largest of the three, and require lots of space. They can obtain lengths between one and two feet, and prefer either brackish or fresh water. They are native to Southeast Asia and are quite predatory, consuming earthworms and prawns. Care must be taken so that they are not overfed, and they should never share a pond with smaller fish (including other goby) as they will devour them. Marbled goby prefer water temperatures between seventy two and eighty degrees Fahrenheit and can tolerate a small bit of salt. Dragon Goby are given their name due to their appearance; however in terms of behavior they are quite timid. As a consequence, they are best paired with other fish that are peaceful. When a group of dragon gobies are kept in the same pond, they can become territorial, so it is essential to ensure they have lots of space. This is a nocturnal species which is most active after dark, and they prefer water which is murky and turbid. They are native to the West Atlantic, and should be fed in the evening. Like the marbled goby, the bumblebee goby is quite large. It can also obtain lengths between one and two feet, especially while in captivity. When selecting these fish in a shop, be sure to examine them carefully as they are vulnerable to infection. 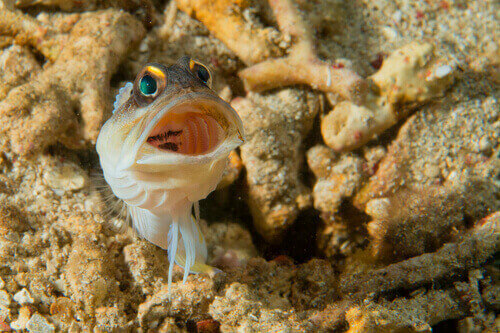 Dragon gobies enjoy eating detritus which means they will filter substrates. This means mud and substrates should be plentiful wherever they are kept. Aside from this, they can also be fed sinking pellets or bloodworms. They prefer water temperatures between seventy four and seventy eight degrees with the pH between 7.0 and 8.5. The cobalt goby is one of the most prized specimens on this list. This is largely due to its beautiful neon coloration, which is mostly visible on males which are mature. In terms of size, it is much smaller than either the marbled or bumblebee goby, and should not be kept in the same pond as them. It will rarely obtain a length of more than two inches, and is native to the coasts of Indonesia, Papua New Guinea and the Solomon Islands. Unlike other gobies, which like brackish water, cobalt goby prefer water which is clean, clear and rapidly moving, with lots of oxygenation. Pond owners who keep these fish will need to change the water regularly, and water temperatures should be kept between seventy five and eighty two degrees Fahrenheit, with a pH of between 6.5 and 7.5.